We are a Quilting Guild based in Lethbridge, Alberta, Canada. 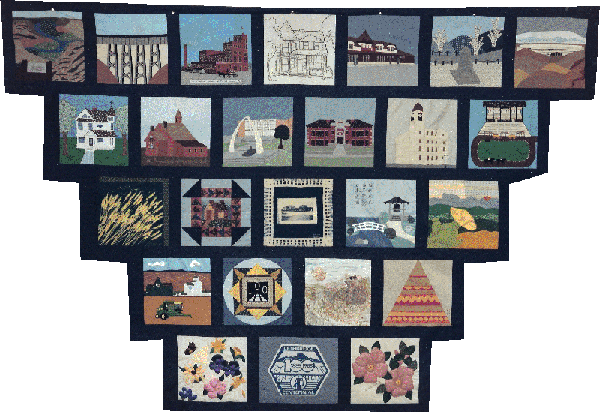 In the spring of 1984, a group of Lethbridge Quilters joined together to make a quilt commemorating Lethbridge’s Centennial. The quilt is pictured above. The enthusiasm generated by this project led to the formation of the Lethbridge Centennial Quilters Guild in 1985. Since that time the guild has met monthly with the purpose of sharing individual expertise and promoting quilting. We currently have over 135 active members in our Guild. We are always accepting new members. The Guild is a non-profit organization. We aim to bring together local quilters to make new friends, learn more about quilting and help the community with quilt related projects. If you’re interested in joining, visit the Membership page.